There are two big stories with Jeff Samardzija right now. One is that he’s almost certain to get traded by the Cubs somewhere around the deadline, as a contender looks for a major rotation boost. The other is that Samardzija is currently 0-4 in ten starts with a 1.46 ERA. Of course, we pretty much never talk about win/loss record, and of course a pitcher on the Cubs is going to have a worse record than he deserves, but for as silly as this bit of trivia is, it really is astonishing. In Samardzija’s ten games, the Cubs have scored 20 runs. Because of those two things going on, relatively few people might have noticed a third thing going on. Samardzija remains a quality starter, but ever so quietly, he’s changed his profile. The starter version of Jeff Samardzija in 2014 isn’t the starter version of Jeff Samardzija from the two previous years, and in particular, this version of Samardzija doesn’t get as many strikeouts, even though he still has all his stuff. Last year, he was tied in strikeout rate with Shelby Miller and Gio Gonzalez. This year he’s even with Kyle Lohse. At the moment, Samardzija is one of the most talked-about pitchers in baseball, and so we might as well talk about why he isn’t quite what he was. It’s not that he’s a worse pitcher. It’s that he’s a different pitcher. Where do you start? Pitch mix, right? Pitch mix is the easiest thing to investigate, and according to Brooks Baseball, Samardzija has moved away from his bread-and-butter, the split. He still has the splitter in his back pocket, because it’s an important pitch for him, but his splitter rate has dropped from 18% to 16% to 10%. Picking up the slack: he’s thrown more sinkers. 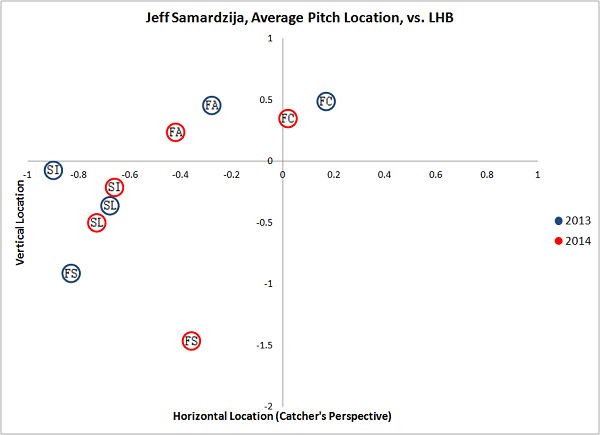 Samardzija, basically, is throwing more hittable pitches. “A couple of years ago I’d keep throwing my splitter, at times with the mentality to punch out a lot of guys. But a lot of time you’re wasting pitches and letting them back in counts,” Samardzija said. After pitch mix, you think about pitch location. I’m going to show you a couple graphs, showing Samardzija against righties and Samardzija against lefties. The graphs will show average pitch location broken down by type, and while it isn’t the best thing to do to come up with an average location, the results can still be telling. Zero on the x-axis is the center of the plate, and zero on the y-axis is the middle of the zone, vertically. In blue, locations from a year ago. In red, locations from this year. 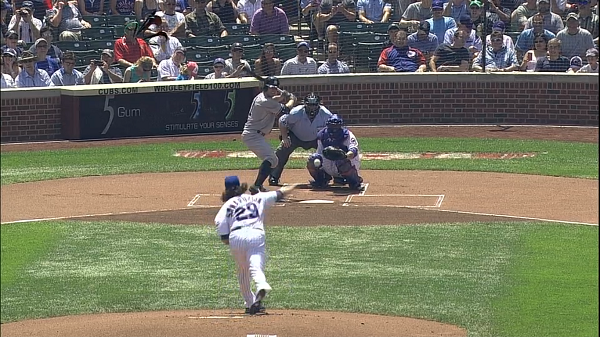 The biggest change, by far, is that Samardzija has thrown his splitter to righties a lot lower and more away. The units, incidentally, are feet. Samardzija has also been more willing to throw his sinker over the plate, and he’s brought in both his cutter and his four-seamer. The slider’s been lower. Four of five pitches have been lower. Samardzija has made an effort to work down, more, trying to get grounders and avoid the homers that’ve troubled him in the past. Another massive change with the splitter. It’s being buried more, and where Samardzija used to throw it off the outside edge to lefties, now he’s a lot more willing to throw it down but over the plate. The cutter is no longer just an inside pitch. The four-seamer has drifted toward the outer edge. The sinker has come back closer to the fastball. 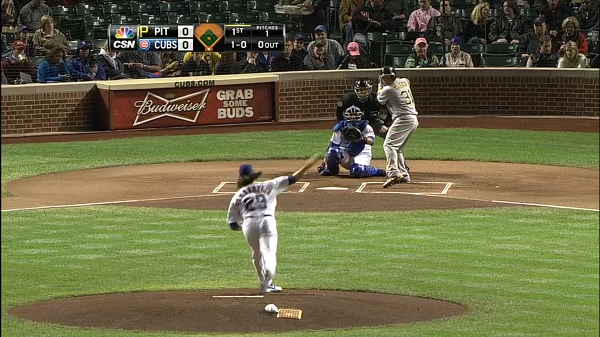 All five pitches are lower, as, again, Samardzija is trying to do what he can to keep the ball out of the air. In his third-to-last start of 2013, Samardzija shifted toward the third-base side of the rubber, and he’s only shifted even more in 2014. The difference is about a foot, as Samardzija now is releasing the ball from behind a right-handed hitter’s back. I couldn’t find any quotes, but, presumably, this is about Samardzija looking for better angles, and in the three starts before Samardzija moved, lefties batted .237, but righties batted .400 while slugging .725. Samardzija was getting abused by right-handed hitters, so he tried to get a better angle against them, as sort of a counter-attack. It’s also worth noting that Samardzija has gradually been dropping his arm angle, though the difference has been more slight. This might be contributing to his splitter having different movement. As screenshot support for the image above, here are three pictures, showing Samardzija before the shift in 2013, after the shift in 2013, and in 2014. Samardzija these days is working from the extreme end of the rubber, and though that could change down the road — it changed just last September — it’s not like Samardzija is feeling any sense of urgency to change what’s allowed him to run such a low ERA. So? Right now, Samardzija’s strikeouts of righties are down, but he’s also trimmed his walks to almost nothing, and he’s getting more grounders. He has yet to allow a right-handed home run. Lefties, meanwhile, are striking out a little less and walking a little more, but they’re also hitting more grounders, and slugging .319. 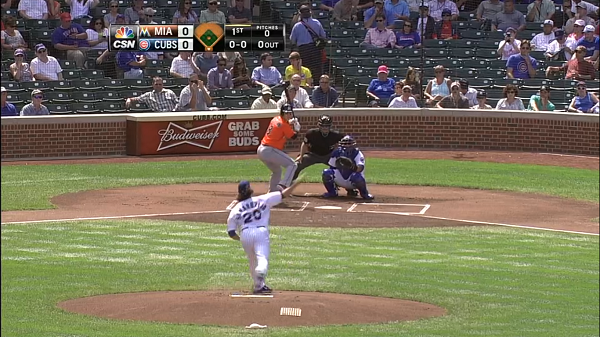 Previously, lefties facing Samardzija slugged in the .440s. It seems like we’ve covered everything, but there’s one last detail, and this might be the most dramatic of all. Last season, Samardzija struck out 23% of batters with the bases empty. This season, he’s also at 23%, with identical walks. With men on, though, his whiffs have dropped from 24% to 16%. About that pitch mix from earlier — let’s break that down some. 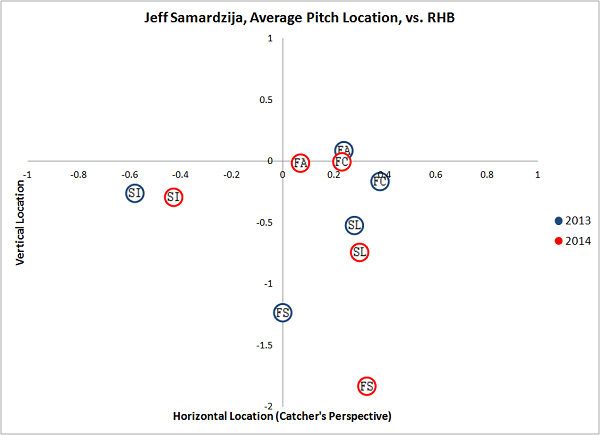 With nobody on base, Jeff Samardzija has more or less pitched like his familiar self. He’s generated familiar results. When somebody reaches, though, suddenly Samardzija is a fastball machine, where he used to throw almost half secondary stuff. His xFIP with men on base is worse. However, his actual results have been much better to date, with one extra-base hit and no homers. There have been grounders, and fewer deep drives, and it seems like Samardzija might be conquering the issue that has previously given him higher ERAs than you’d expect. Of course, in time, there will be more homers, and Samardzija’s ERA will start with a 2 or a 3. Elements of his game right now are unsustainable, statistically, and it seems like he might want to prioritize strikeouts more with men on. But that hasn’t worked great for him in the past, so you can see why he’s interested in adjustments. You can see why he might want to throw fewer splitters, and you can see how Samardzija can succeed as a pitcher as less of a strikeout pitcher. If Samardzija ever wants to go back, he probably could, because he still has the repertoire. But if he likes this approach, and if the splitter is just a bit less useful from a lower slot and a more extreme angle, Samardzija is running the same xFIP- as he did last season. Samardzija is no less interesting than ever. Samardzija is no less effective than ever. We hoped you liked reading Jeff Samardzija, In the Name of Efficiency by Jeff Sullivan!